Prophet Johnson slices past Springboro defender Noah Moser. Miles Johnson buries a first half 3-pointer against Springboro. Danny Lewis, who led Northmont with 17 points, fights his way past Willieon Yates. 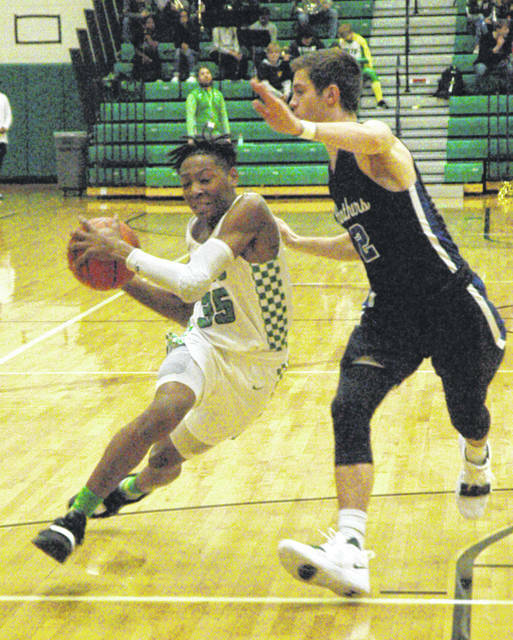 CLAYTON — After a season opening road victory 69-60 at Stebbins the Northmont Thunderbolts made it two in a row Friday by posting 51-47 win at home vs. Springboro. Springboro’s 6-foot, 7-inch senior forward Garrett Powell scored a game-high 24 points, 15 of which came in the second half, but it was not enough to overcome a balanced Northmont attack that saw eight players score. 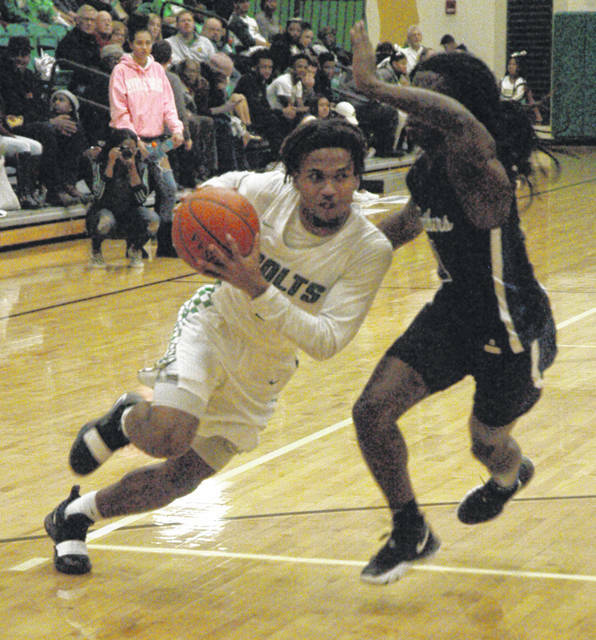 Senior guard Danny Lewis scored nine fourth quarter points while sophomore forward Jordan Smith had six and sophomore guard Prophet Johnson had five to help lift Northmont to victory. The Thunderbolt led 11-8 after a nip and tuck first quarter and opened up a 21-10 lead midway through the second period before the Panthers closed the gap to trail 24-19 at the half. Springboro’s second quarter surge carried over into the third quarter. 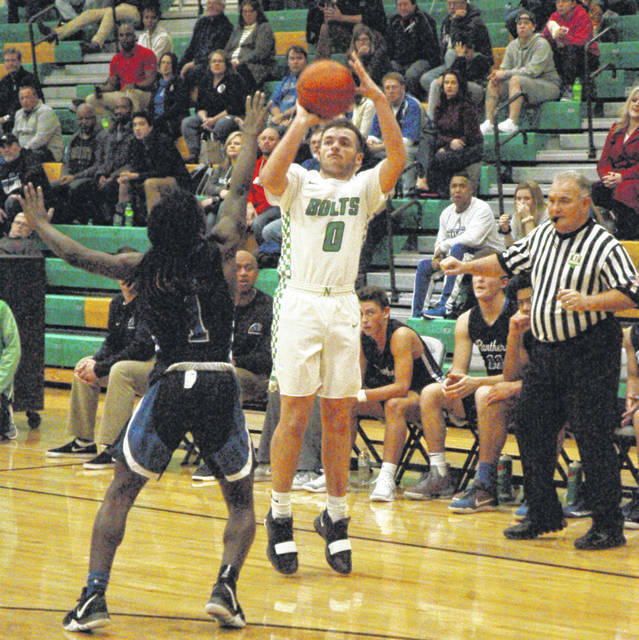 Michael Berner scored consecutive baskets after Northmont misfired on its first two trips to the hoop and Powell followed with a basket inside the paint to give the Panthers a 25-24 advantage. Powell closed the third quarter with a 3-pointer to put Springboro up 34-29. The tables turned in the fourth quarter with the Panthers missing shots on their first two trips to the hoop. Lewis scored for Northmont and 6-foot, 5-inch sophomore forward Jordan Smith cashed in back-to-back baskets and drew a foul from C.J. Emanuel on the second basket. Smith sank the bonus shot to put Northmont back on top 36-34. Lewis added a free throw but Powell buried a trey to tie it 37-37. Northmont took the lead for good after sophomore forward Patrick Ivory sank a pair of free throws and Lewis scored inside the paint to put Northmont up 43-39. From there the Thunderbolts hung on to secure a four point division victory to improve to 2-0 and 1-0 in conference play while the Panthers fell to 1-2 overall and 0-2 in conference play. Kincer was thrilled with his team’s performance, especially since he had three sophomore starters on the court. Springboro: Willieon Yates 2-0-5, Garrett Powell 11-1-24, Landon Palmer 2-0-5, Michael Berner 3-2-8, Connor Grevey 2-0-5. Totals: 19-3-47. Northmont: Miles Johnson 2-0-6, Danny Lewis 7-3-17, Patrick Ivory 1-2-4, Justin Golson 1-0-2, Jordan Smith 2-2-6, Ifeanyi Nwanoro 1-2-4, Corey Gay 1-1-3, Prophet Johnson 4-1-9. Totals: 19-11-51. 3-point goals: Springboro 4 (Yates, Powell, Palmer, Grevey); Northmont 2 (Johnson 2). Records: Springboro 1-2 (0-2), Northmont 2-0 (1-0). JV Score: Springboro 63 Northmont 54.